From 1927 until 2003 NECCO was headquartered in this building, and its water tower painted to replicate the familiar NECCO wafer roll was an iconic part of the Cambridge skyline. In 2004 NECCO moved production and headquarters to Revere and the building was occupied by Novartis Biomedical Research and the water tower was redesigned with a double helix. When built in 1927, this factory was the largest in the world devoted to candy making. In fact, many of the features that made the NECCO building state of the art in 1927 also made it ideal for conversion to lab space. Made of concrete instead of steel frame, the building resists vibrations, Floors between 9-14 inches thick can hold as much as 250 pounds per square foot, strong enough to support storage tanks, mixing vats, conveyer belts, and now robotics and screening machinery used in drug research. The Novartis conversion of the factory was a $175 million project partly to remove sugar spores in the pores of the walls and sticky residue from the floors. Though the era of the local candy bar is virtually over, NECCO remains an anomaly in the candy world. It is one of the two remaining players of consequence in the New England candy world, neither of which is locally owned. Today, NECCO is the oldest continuously operating candy company in the U.S. The company’s Revere plant and another facility in Wisconsin collectively employ about 650 people. Annual sales for the company frequently reach $100 million, backed primarily by their popular Valentine conversation hearts. NECCO has one of the richest local histories in the industry. It dates back to 1847 when brothers Oliver and Silas Chase patented the first American candy machine and started producing sugar wafers. Early versions of the candy were distributed to Union soldiers during the Civil War. Today, the wafers are believed to be the oldest American product continuously manufactured and still sold in unchanged form. In 1901, Chase and Company merged with Ball and Forbes and Bird, Wright and Company, two other Boston-based producers, to become the New England Confectionery Company. Ever since its inception, NECCO has had a firm grasp in American life. In the 1930s, Admiral Byrd, who brought Squirrel Nuts to the South Pole, also brought along NECCO wafers. In 1938, NECCO became the first candy manufacturer in the country to introduce a molded chocolate bar having four distinctly different centers encased in a chocolate covering. The Sky Bar was first announced to the public by means of a dramatic skywriting campaign. In the early 1940s, NECCO turned over a portion of this plant for manufacture of war materials and also used all of its candy facilities for providing rations to armed forces of WW2. NECCO wafers do not melt and are practically indestructible during transit, making them perfect to ship overseas to the troops. In 1945, the blackout and curfew in Times Square, NY was lifted on VE-Day after three years of darkness, and NECCO’s Sky Bar advertisement was one of only six display signs that had their lighting equipment ready. After the war and through the 1990s, NECCO acquired small candy companies throughout the U.S. and Europe, and the right to manufacture their trademarked candy bars. Thus, while still loved as a regional brand, NECCO transformed itself into a national conglomerate and avoided being devoured by larger companies. 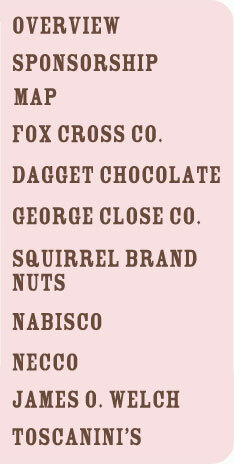 Some of its acquisitions include Candy House Buttons, Stark, maker of the Mary Jane, and the Clark Bar of Pittsburgh. Through these gains, NECCO has amassed somewhat of a retro candy empire and continues to provide us with some of our childhood favorites. ©2011 Researched and written by Natalie Moravek. Designed and coded by Kristin Powers.